One hilarious story from three wildly different perspectives! Laugh your way through a hilarious story told from three perspectives! 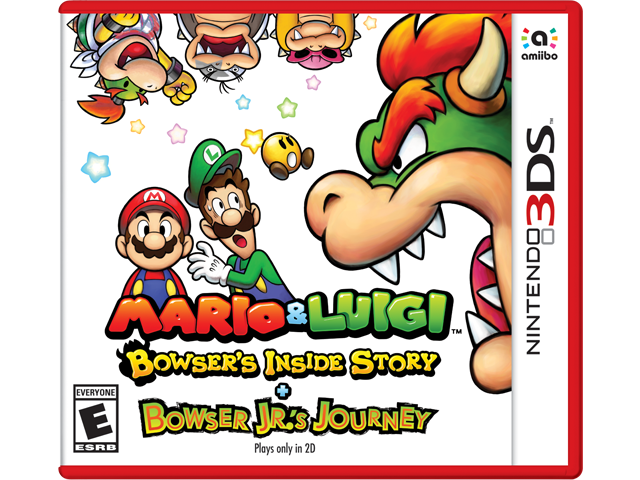 Search the Mushroom Kingdom for a cure as Bowser, explore his innards as the Mario Bros., and discover the untold story of Bowser Jr.’s Journey. Overcome the fury of Fawful, action-packed battles, puzzling tasks, and giant bosses in a classic action RPG—stuffed with new content! Mario and Luigi are stuck inside Bowser, forced to accomplish unusual tasks to assist their arch nemesis with hero stuff across the land. The scenes and dialogue that ensue will have you cackling like Fawful, even in battle! Time your button presses and keep up with the action: turn the system sideways, blow into the mic, or tap the touch screen. In an all-new mode, Bowser Jr. will cross paths with our unlikely allies as he recruits Ranged, Flying, and Melee troopers to fight for his cause. Strategically form teams and pit them against enemies to reign supreme in frenetic combat.